The SWBAT solve addition and subtraction problems by making a model. The word problems in this lesson will have the students making models to solve them. By making a model, that will help the student see what part of the problem to find. While teaching this lesson it is important to allow students to represent the math problems using manipulatives. They need the opportunity to connect the representations and be able to explain their rationale. Nan sees 16 birds in the tree. Some birds fly away. There are 9 birds in the tree. How many birds flew away? Guide the students through the following steps to building their model. How many birds were in the tree? 16 – have students connect 16 yellow cubes together. How many birds are left in the tree now? 9 – have students connect 9 red cubes together. Have students place the two cube trains next to each other and count how many more of the red cubes they will need. This will represent the number of birds that flew away. 7 birds flew away. One misconception that some students may have for the standard OA.A.1 is that they may assume that there is a key word or phrase in a word problem that suggests the same operation each time. For example they may assume that the phrase "left" always means to subtract. To help overcome this misconception, it is important to talk through how to analyze word problems to determine if addition or subtraction is necessary. I see 4 dogs in the park. Some more dogs come to the park. Now there are 12 dogs in the park. How many dogs came to the park? Ask students to make a model using their connecting cubes. Walk around to monitor students making their models. It is important to have students make a model so that they can move from the concrete to the abstract in their mathematical thinking. Have students turn to their shoulder partner and explain how they found the answer. This is important to help students build their math vocabulary and "math talk". There are 14 turtles on the beach. Some turtles swim away. Now there are 9 turtles on the beach. How many turtles swam away? During the independent practice portion of this lesson, students are given the Add or Subtract word problems worksheet. 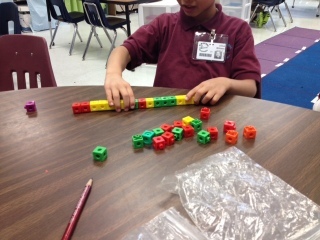 Students use their connecting cubes to make a model that will help them solve the problems. I also use this time to pull struggling students and work with them in a small group. In closing the lesson, I have students write their own word problem in their journal, and have their shoulder partner solve the problem. By doing this, it allows for students to have a firm grasp of the concept of what is needed in word problems along with allowing them to "teach" their shoulder partner. 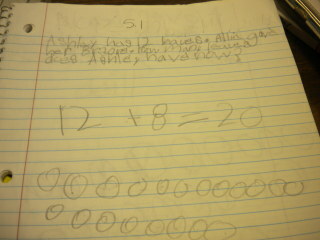 In this student journal, the student wrote out the word problem and their partner solved it by drawing pictures.